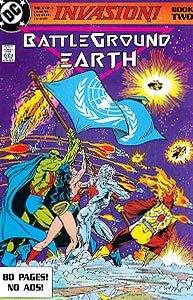 Brief Synopsis: The heroes of the DC universe, led by Captain Atom, combine forces to halt the Dominion organized Alien invasion of Earth. Issue Notes: This is the second of three books in the Invasion! crossover event. Booster appears in a crowd of Earth's superheroes being briefed by Captain Atom, General Wade Eiling, Amanda Waller, and Maxwell Lord. 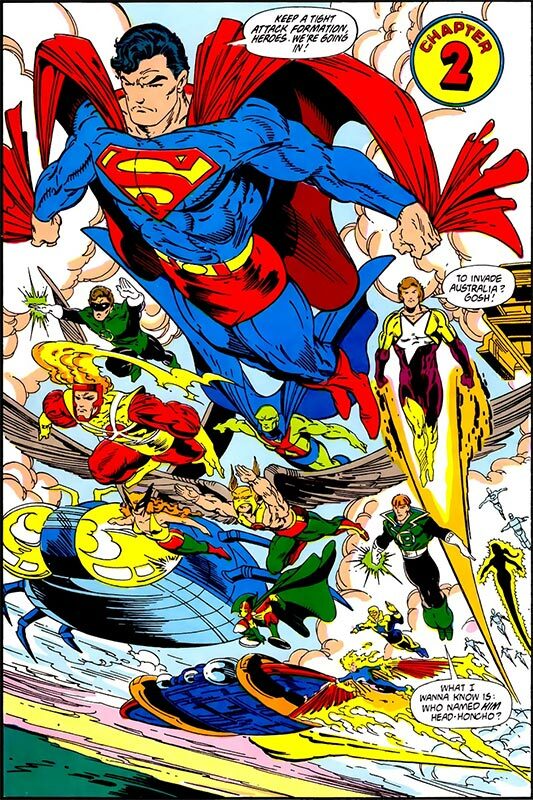 Although it is difficult to determine exactly who the assembled heroes are because of their small size, they include Adam Strange, Ambush Bug, Aquaman, Batman, Blue Beetle II, Creeper, Dove II, Firestorm I, Guardian, Guy Gardner, Hal Jordan, Hawk I, Hawkman II, Katana, Martian Manhunter, Mister Miracle I, Negative Woman, Nuklon, Obsidian, Phantom Stranger, Power Girl, several Rocket Reds, Robotman II, Spectre, Starman V, Swamp Thing, Wild Dog, and Wonder Woman I. This is certainly Boosters' first encounter with several of these heroes. Booster joins Superman's super-powered strike force in their sneak attack against the alien forces holding Australia. Other heroes in the liberation force include Big Barda, Blue Beetle II, Creeper, Fire, Firehawk, Firestorm, , Green Lantern II, Green Lantern Guy Gardner, Hawkman II, Hawkwoman I, Martian Manhunter, Mister Miracle, Negative Woman, Peacemaker, and Starman V, among others, not clearly indicated. Boosterrific Review: By assembling their forces and facing the assembled Alien Alliance, the heroes of Earth provide a compelling if familiar story of mankind's resolve against impossible odds. Though there will no doubt be many who disagree, this issue would be drastically improved without artist Todd McFarlane's clownish and wildly inconsistent pencils. Thank you, thank you, thank you for calling a spade a spade! I've never liked Todd McFarlane's pencil work despite so many fans just eating it up. Maybe his forte is toy design, because his depiction of DC's superheroes leaves me cold. On the bright side, Invasion also featured the artwork of Bart Sears, which helped.